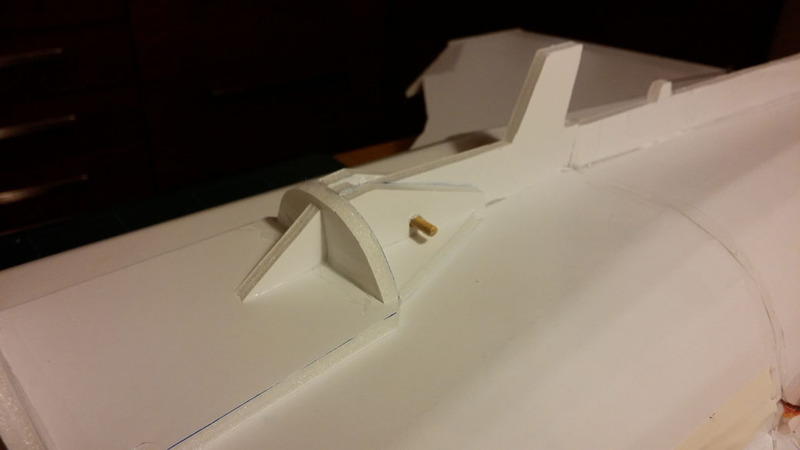 If you are interested in building and flying this plane, please keep on reading. 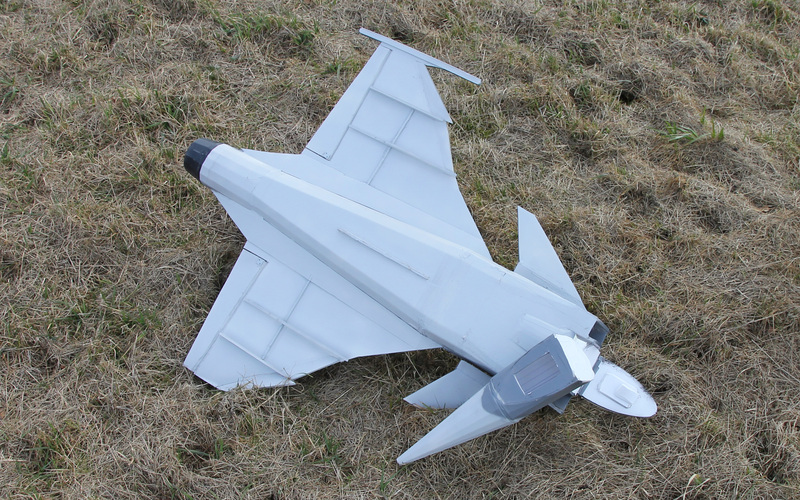 Ever since I saw the awesome JA-37 Viggen made by David Windestål, I've been thinking about making an EDF-jet of my own. 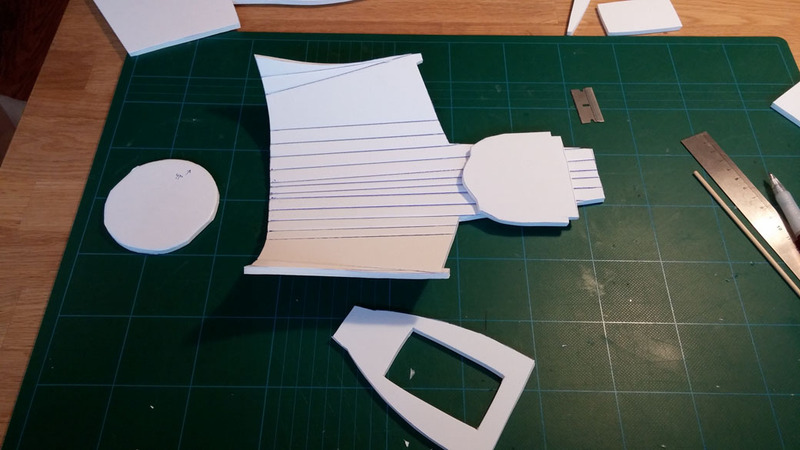 However, I did not want to mess around with all those formers and hot-wire cutters, since it seemed so time-consuming and seemed to be more a work of art than easily replicable. 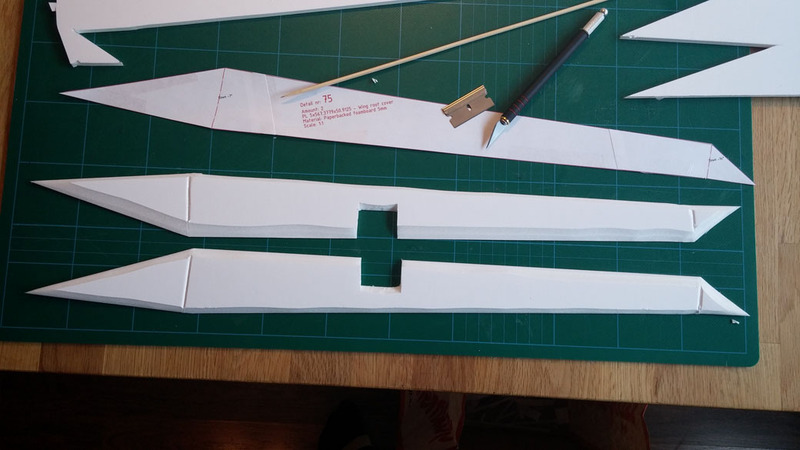 I therefore wanted to see if it would be possible to make a good-looking scale jet out of regular Dollartree foamboard instead. 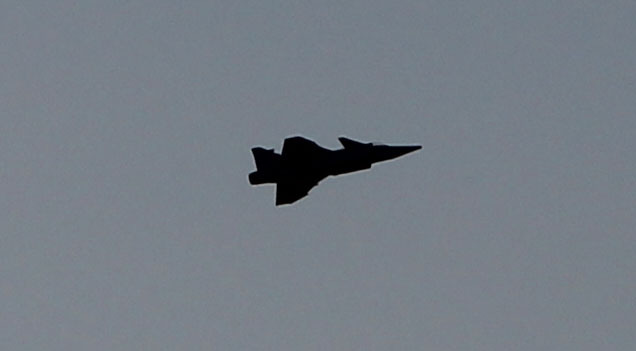 Since I am a Swede too, I wanted it to be a Swedish jet. 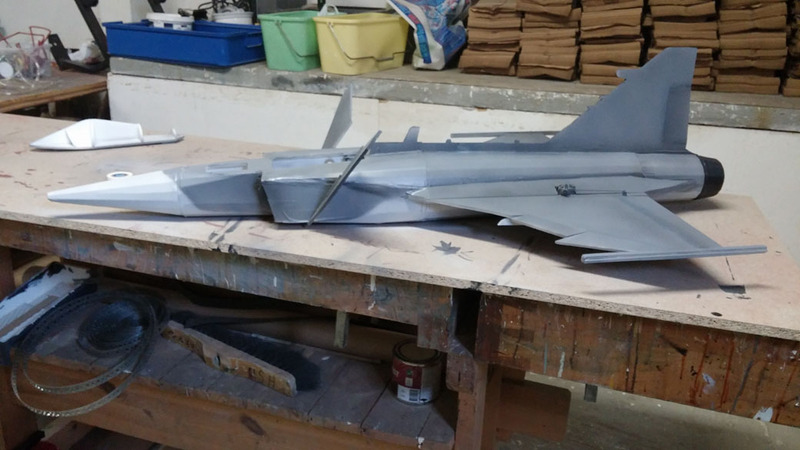 Since the Viggen was already done, it felt natural to make the JAS-39 Gripen. 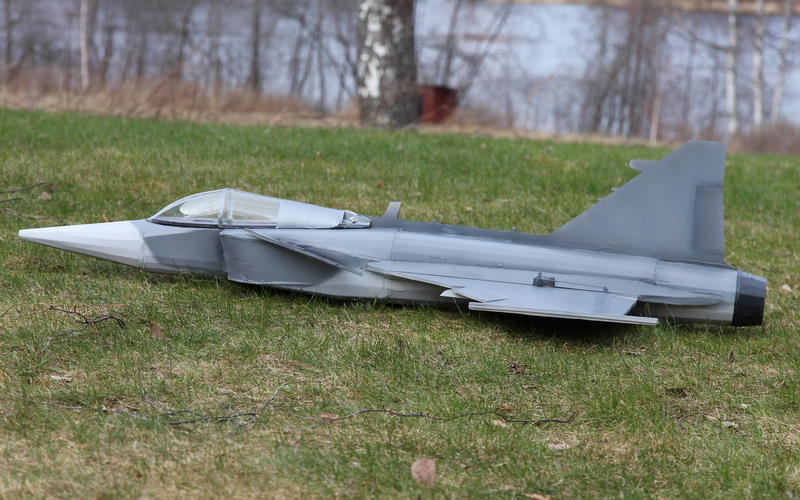 I also really wanted it to have fully articulating canards, something that the Gripen has but the Viggen does not. I have modeled this plane completely in 3D, so the plans are already available in the article. 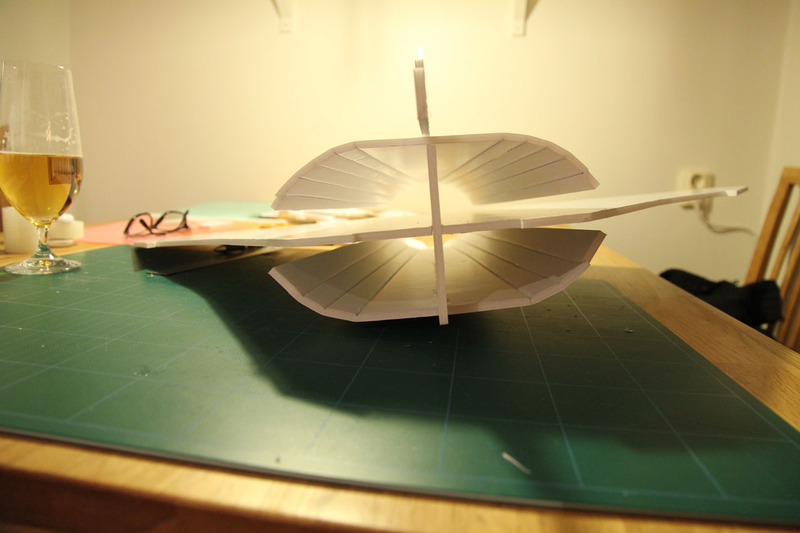 However, as I started building the plane, I continually made changes and improvements. 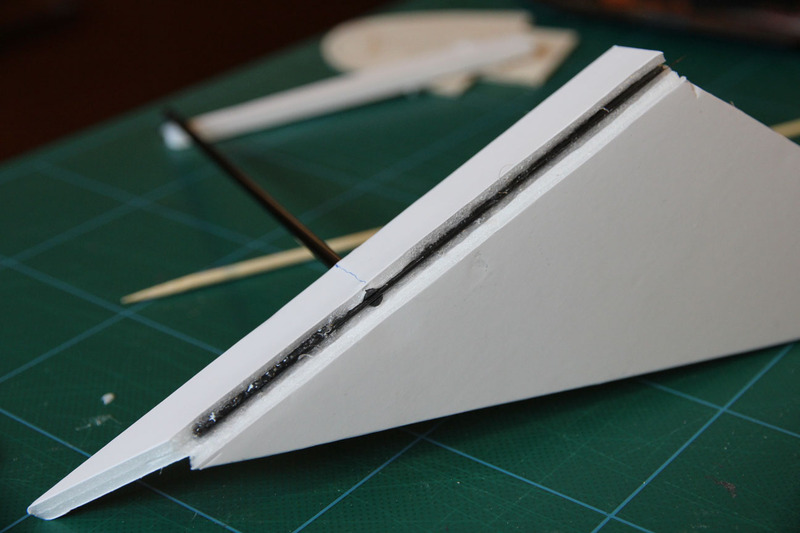 For example, I originally had the idea of making the nose out of bluecore foam, but I later felt that it might scare some away from building the plane - including myself - so I changed it into foamboard too. Rather than mess up my original article with too many updates, I will follow up my build in this thread here, where it's OK to make updates and changes as the project goes along. I'd also be thrilled to hear what the more experienced pilots have to say about it, because I am far from good enough to tune this bird properly. If anyone cares to build one too, that would totally make my day. The 3D model and plans, in their current state, will be attached to this post. They differ a bit from the ones in the article. 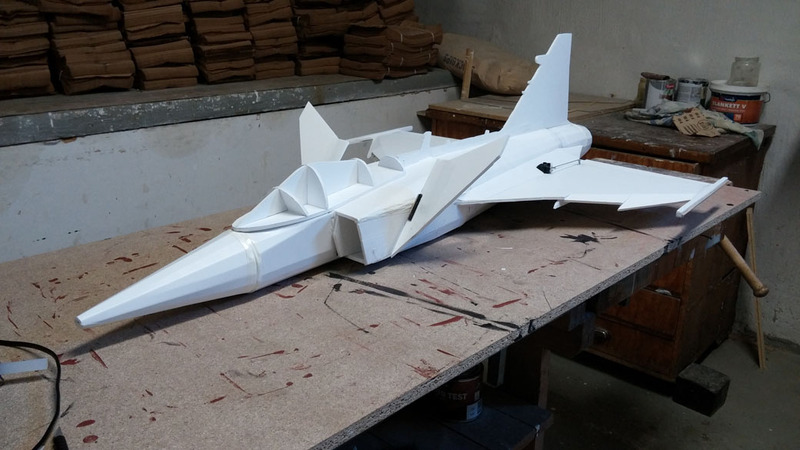 Version 1 of the Gripen, as seen in the picture above, is finished. Weigh: ~1050g without battery. I use a 3300mAh battery, weighing in at 337g, so total weight is about 1400g. 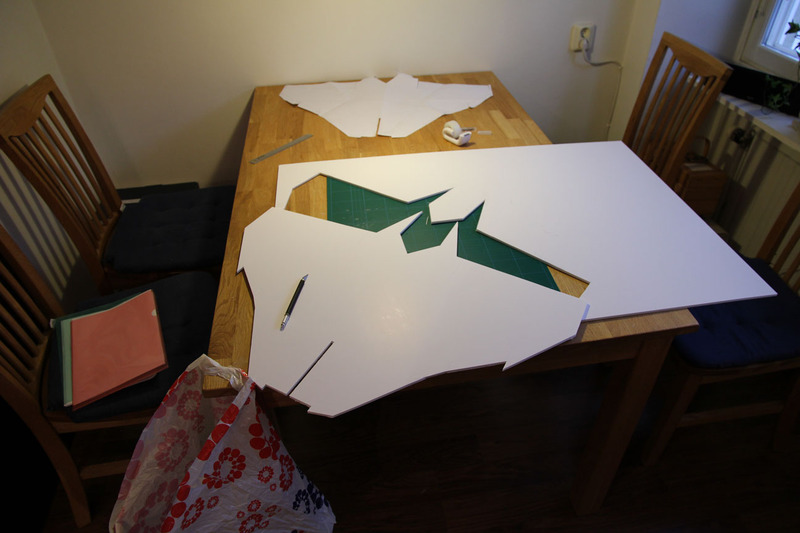 Thats a tad bit on the heavy side, because the foamboard I have is heavier (and stronger) than Dollartree foamboard. If you have access to Dollatree, you can subtract 200-300g from the weight. I have three control modes, mapped to the three-position switch, which deals with different ways of elevator control. I can control elevator with only elevons; with elevons and canards for extreme control; or with just canards, like the real plane. Roll is always done with the elevons - the canards are not split. I had my first flight today, in pretty heavy winds, which probably was not very smart. It did give me the chance to test the durability of the plane, though. 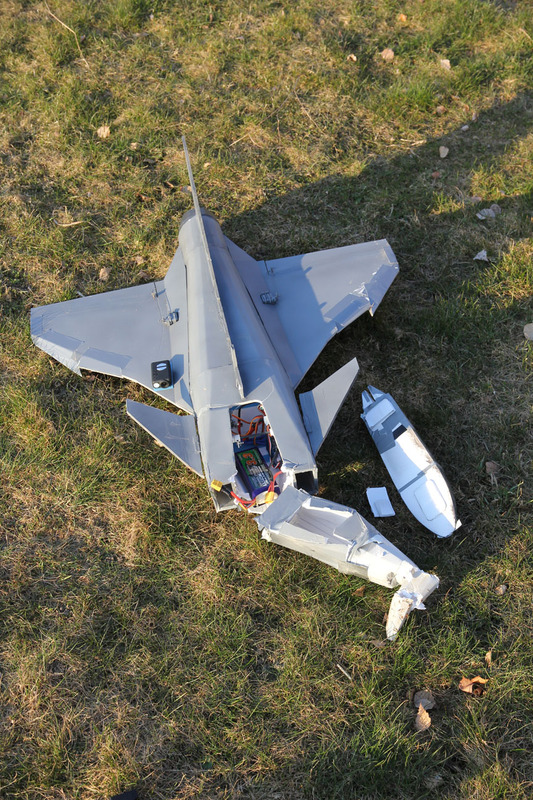 My first attempt ended in an immediate crash, since the wind caught under one wing and made me tip-stall. Results of the damage are below. Nose and one wingtip hardpoint broke off, but otherwise she was fine save some scuff marks. 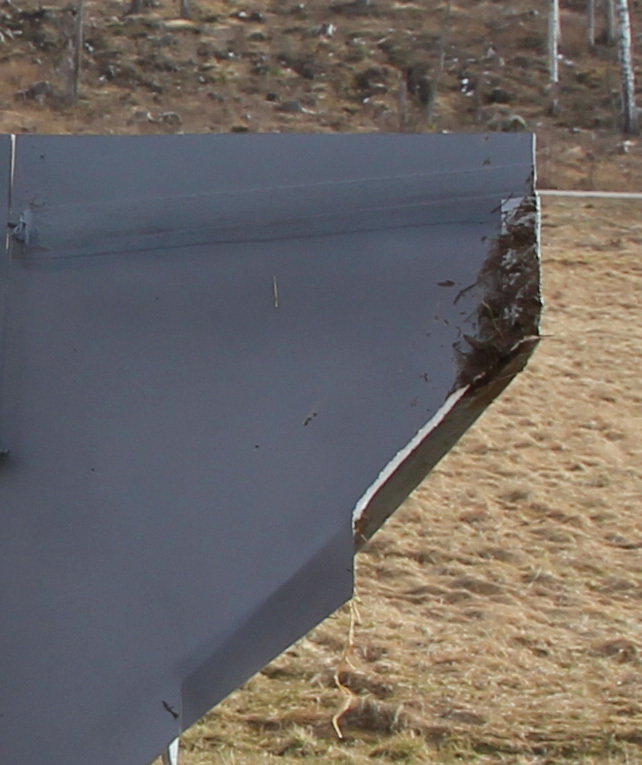 I designed the nose to break off, like the FT Viggen's. Hats off to David for the great idea! The nose was easily put back on with a piece of tape on top and bottom. 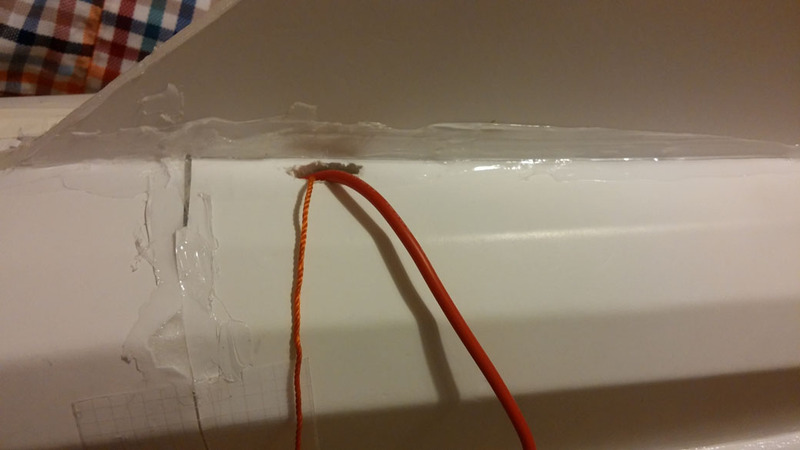 I removed the hardpoint, but those are also easily attachable with tape. 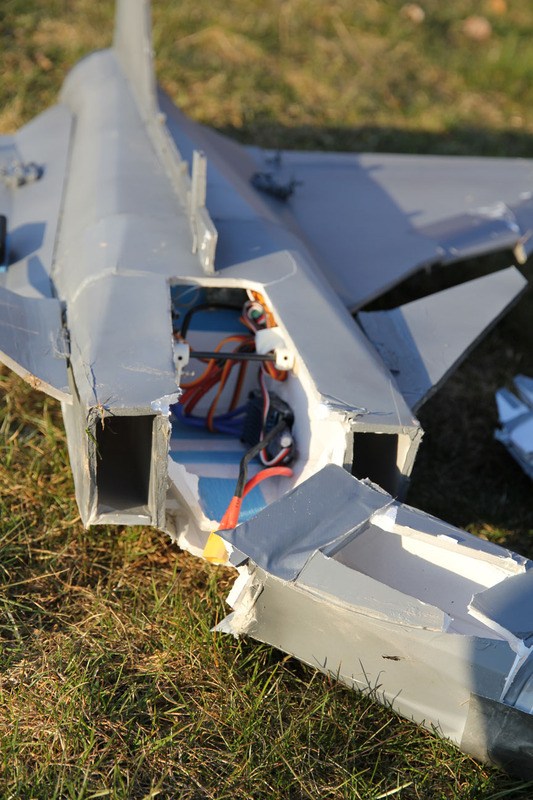 The second flight ended in a controlled landing, but the leading edge flaps caught in the long grass and broke. 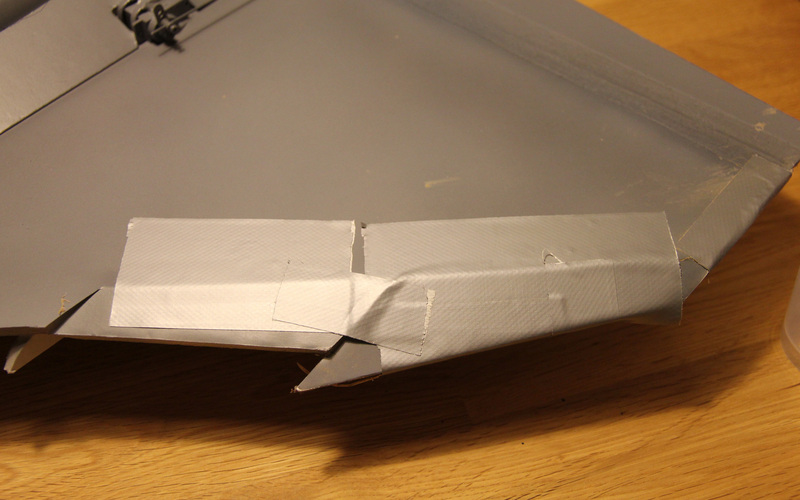 That too was easily fixed with some tape on top of the wing. 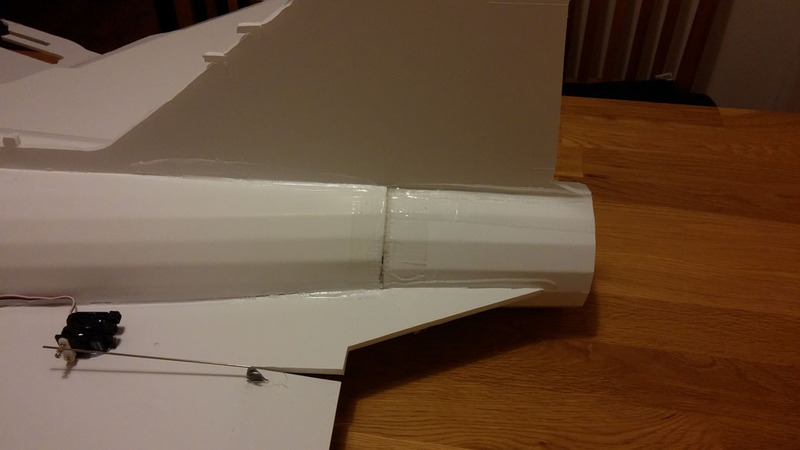 I recommend to strengthen the leading edge flaps with some extreme packing tape from the start, just like the elevon hinges. See you in post two for build pictures. 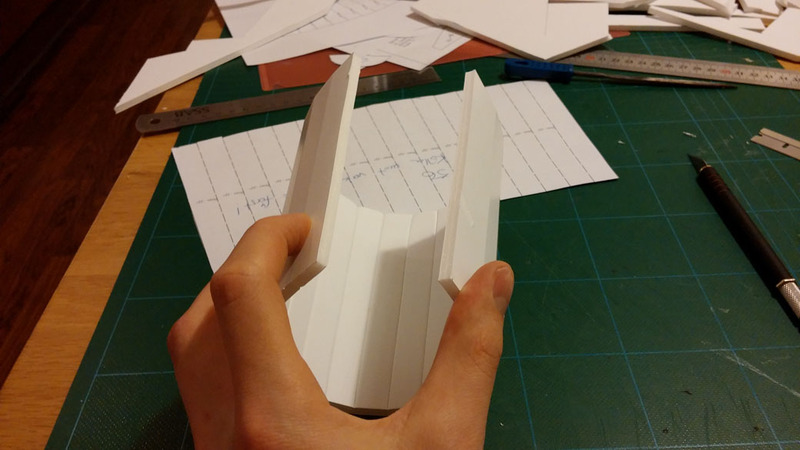 Note: the version 2 plans are out, and the build process is a bit better, although not perfect. 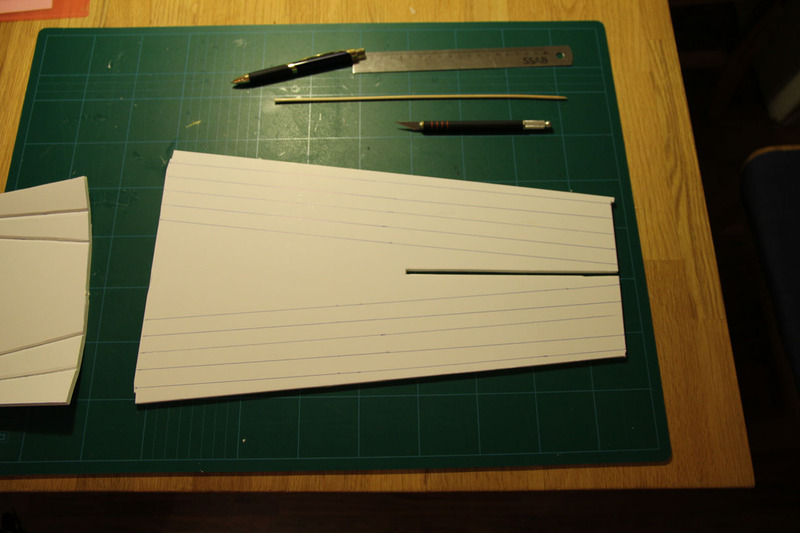 The front part of the body was cut into a single piece instead of two, which makes the inlets easier to fold. Until I have a final version (that's verified to fly properly) it's better if you ask questions, I'm not going to do a build log or video of an imperfect construction. Build pictures of version 1, roughly in order of build. I'll share them now, as is, in hope that it may help. I'll try to put together a better build instruction once I have my version 2 going, because there were a few things that can be improved. 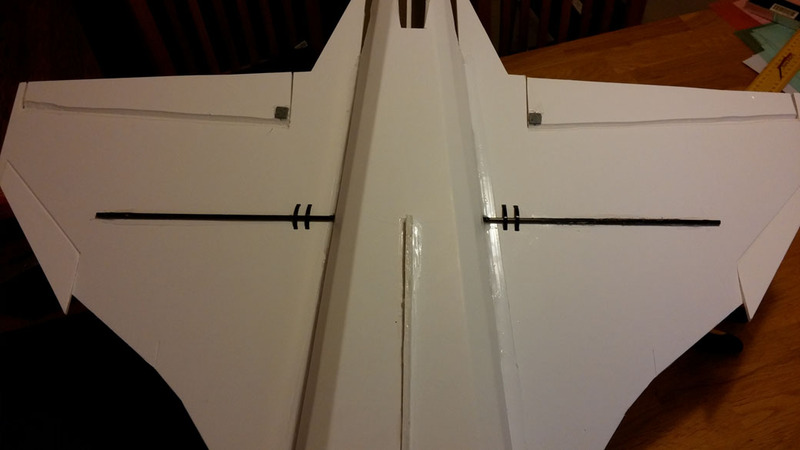 Top and bottom fuselage slides into slots in vertical body. 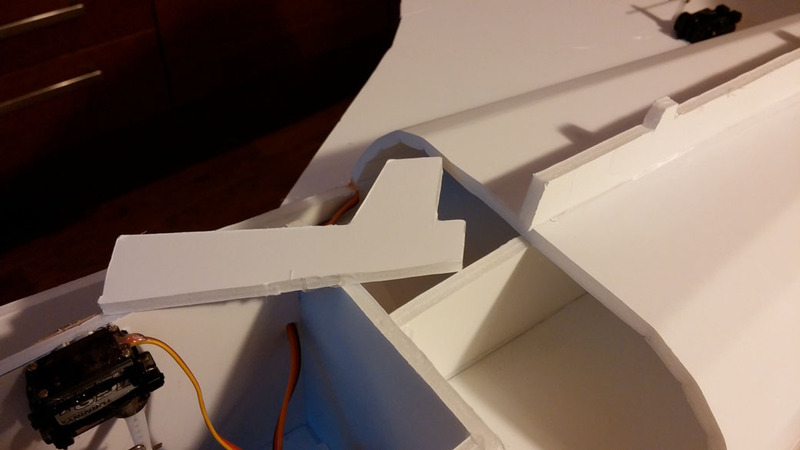 Just test fitting now, and this will probably be changed in version 2, since it was difficult to slide this in place while having hot glue in the long slots. 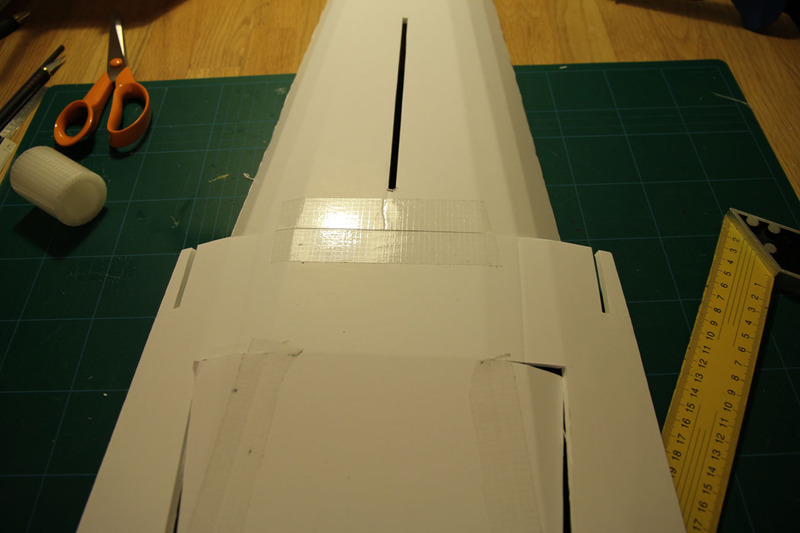 I'll probably just cut off the top part and glue the vertical stabilizer later. 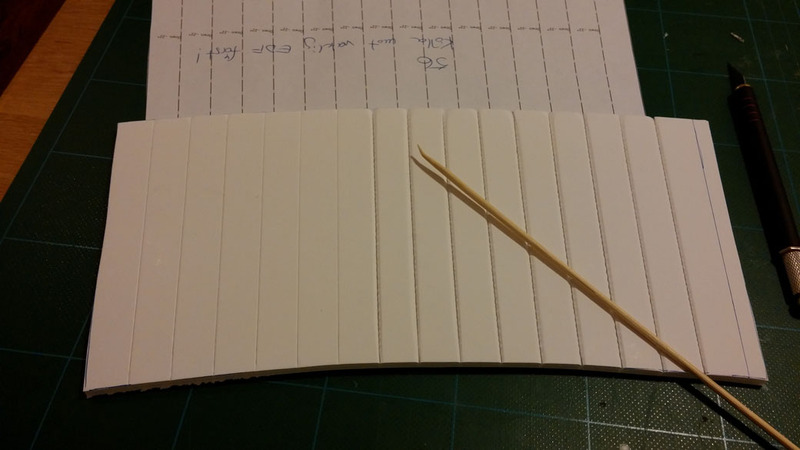 Join the two bottom parts with tape on one side, put hot glue in between and then another piece of tape. This makes for a strong bond. 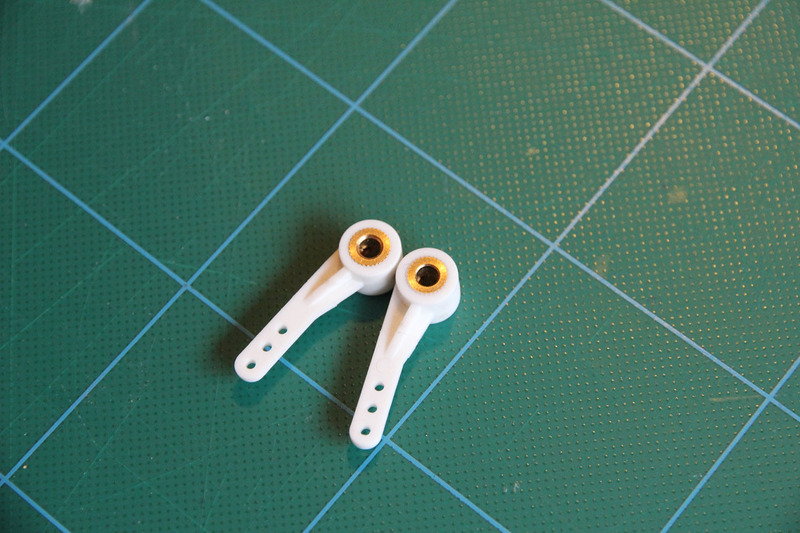 Place the parts for the power pod. 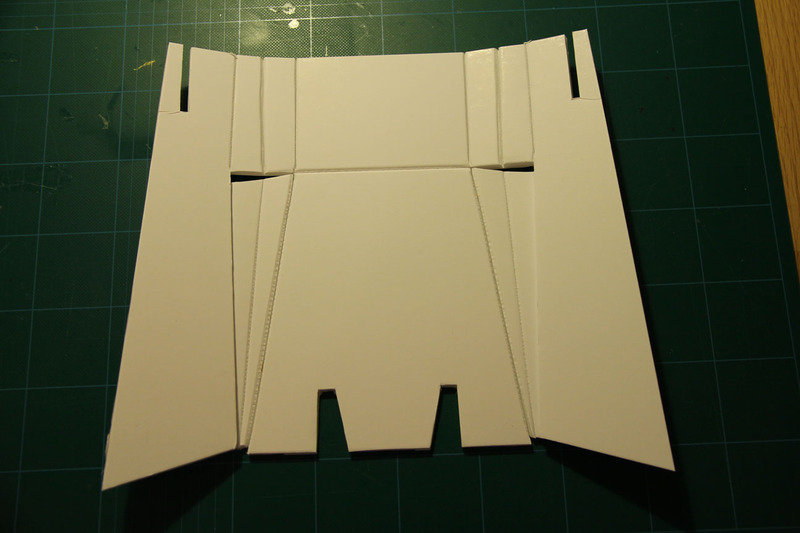 Lift the lower body to meet the two vertical parts, which also makes up the inner wall of the inlets. 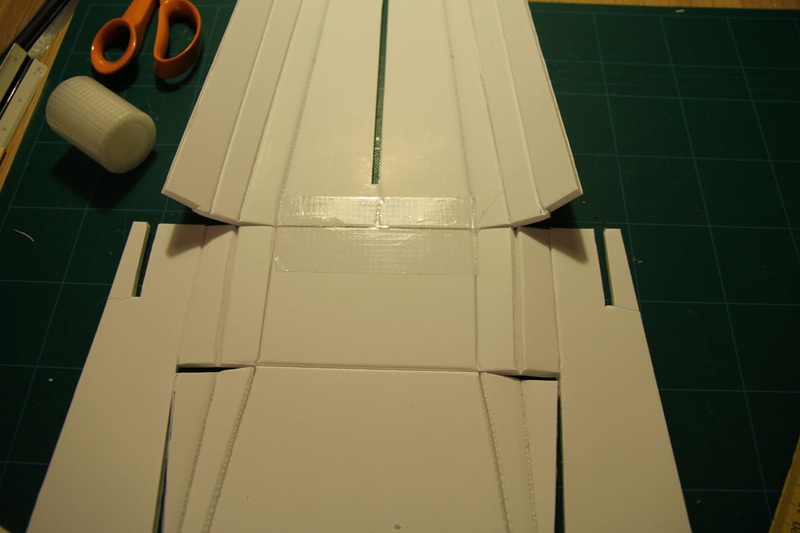 Fold the outer parts up and join with hot glue and tape. This was a bit tricky and can probably be improved. 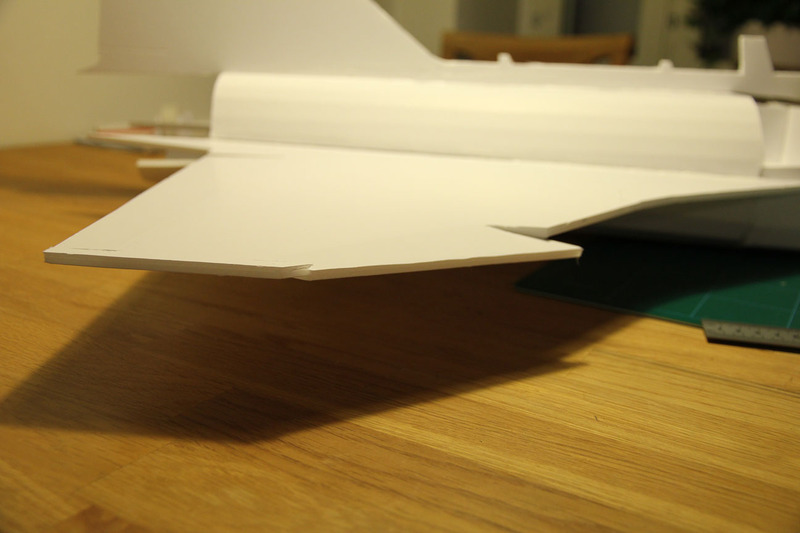 At some point, you can make the leading edge flaps according to the plans. 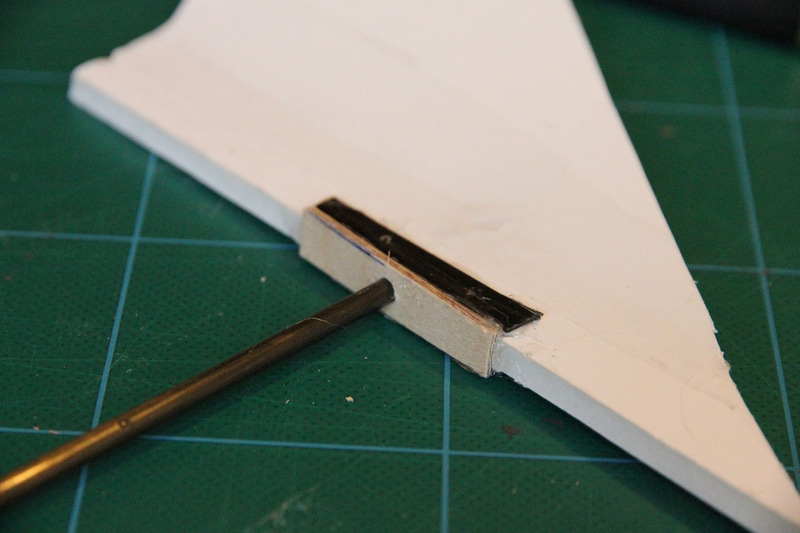 That's probably easiest to cut while the main wing is still unattached to anything. Mechanism for the canards. 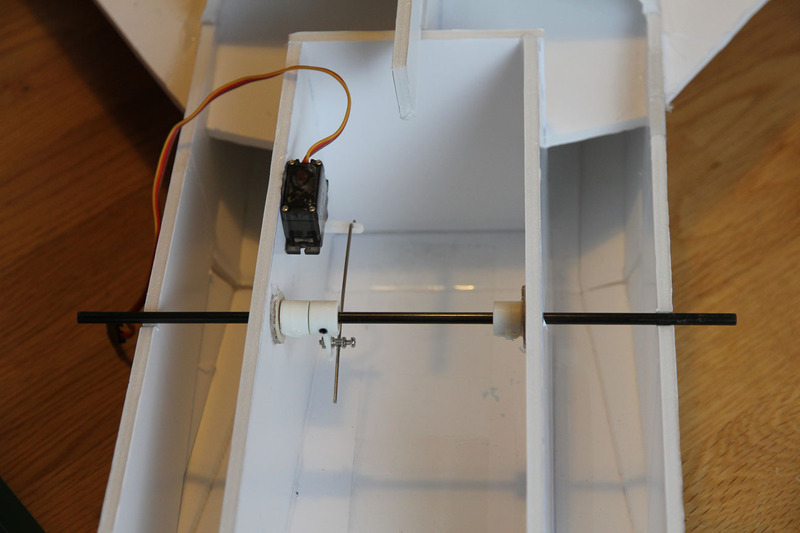 I have a 4mm carbon rod going through the inner and outer walls of the inlet/power pod. I use steering wheel arms both for control linkage and for stability. 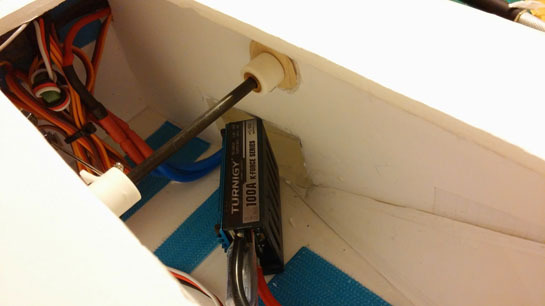 I also took two pieces of 1,5mm plywood and drilled 4mm holes in them, to get a snug fit. Unfortunately, I only put them on the inner walls, but it would probably also be good on the outer walls, for crash resistance. I enlarged the holes a bit while cartwheeling the plane. The canards were split along the drawing marking, to create the slight angle. I also placed an thin flat carbon fiber spar there, which will help with rigidity and to get the torsion moment into the carbon fiber axle. 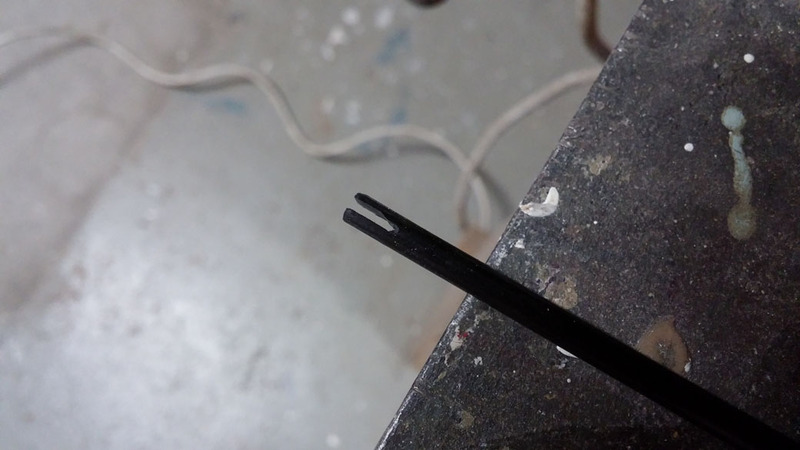 I used a dremel to make a thin slice in the 4mm axle, which slides on top of the flax carbon fiber part inside the canard. 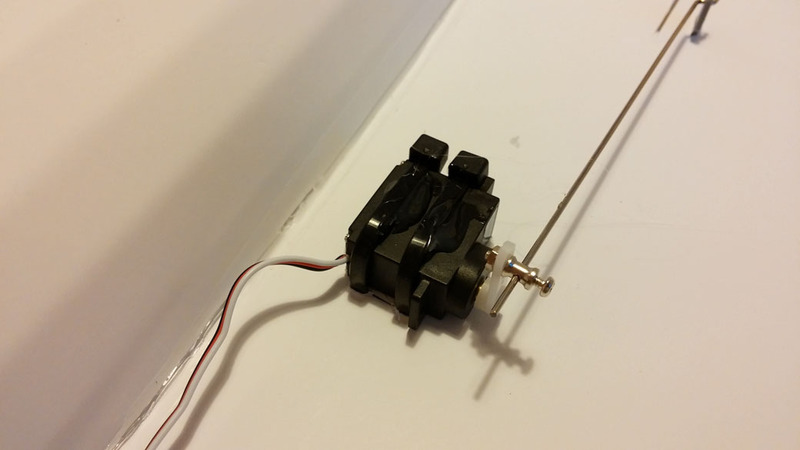 I also strengthened the fastening of the canard servo. 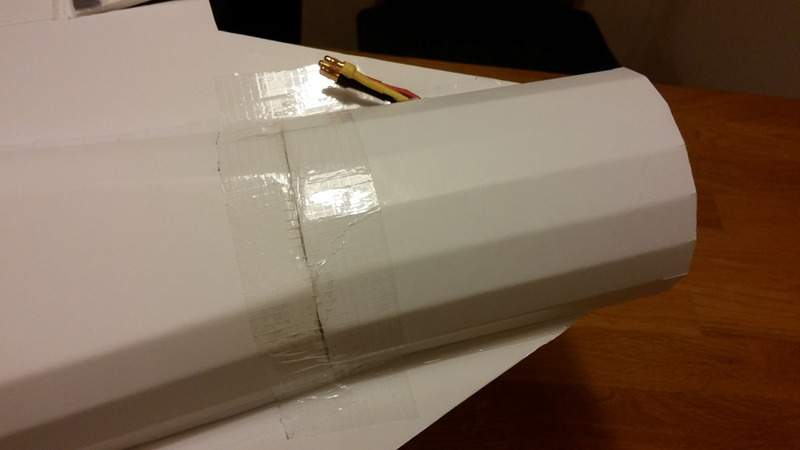 It's both glued to the foamboard and wrapped in zip ties. It's not going anywhere. 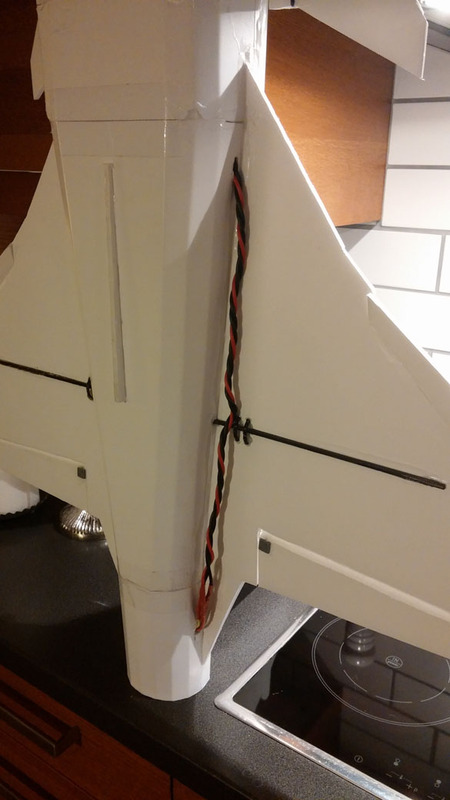 Elevon servos were also fastened wit hot glue and zip ties through the wing. 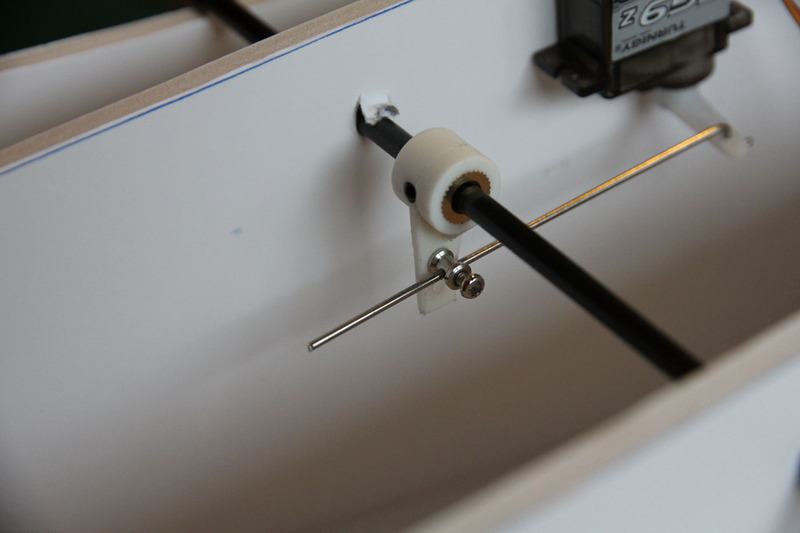 I put in a varbon fiber spar through the body too, although it probably is not necessary, not with the strong foamboard I have. It does provide a good thing to wrap the zip ties around, though, which was the main reason I thought of it. These parts make up a lot of crash strength, since they distribute force from the front of the power pod and nose into the walls and rear of the main body. The distance between the triangular parts and the inlet walls is too big, though. 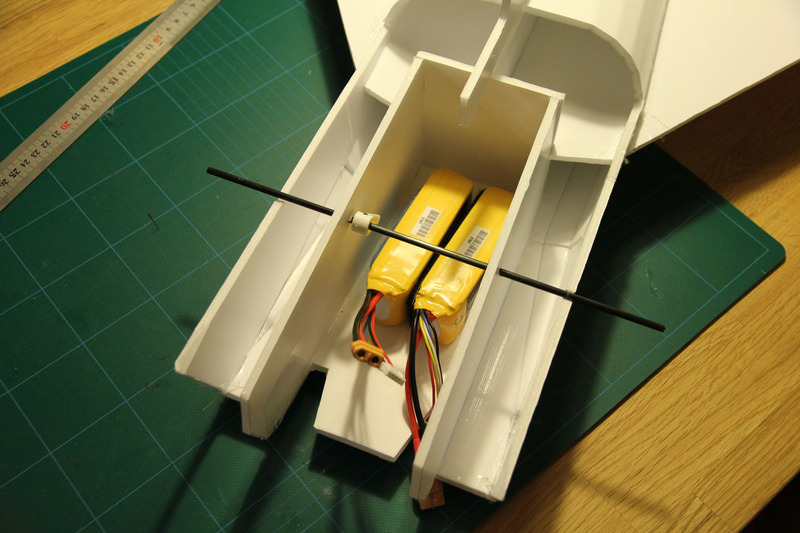 I will make version 2 "more square", which will make more space for batteries and also make the plane look better. EDF container. Lots of score cuts will make for a very round and nice shape. Edf unit. I had to make a couple of distance rings to fit inside the EDF container. Not included in the plans, but easy to make yourself. 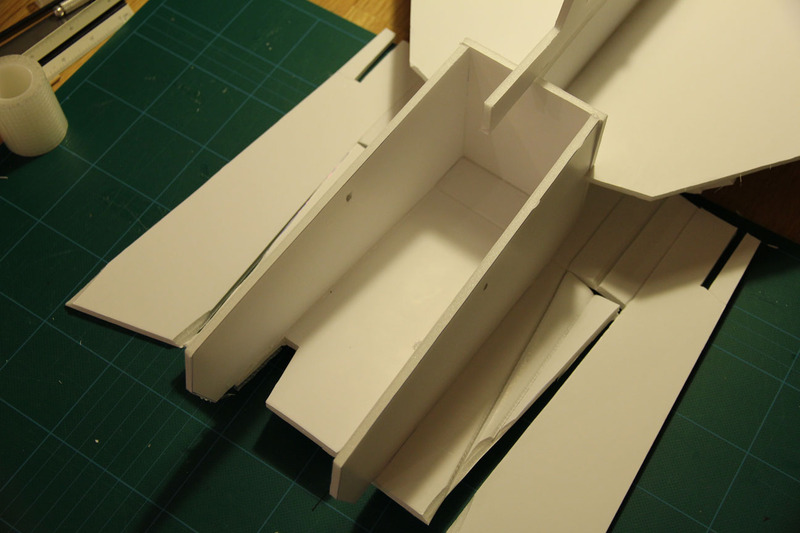 I'll see if I can include some variations in plans for version 2. I snaked the motor leads out the side. 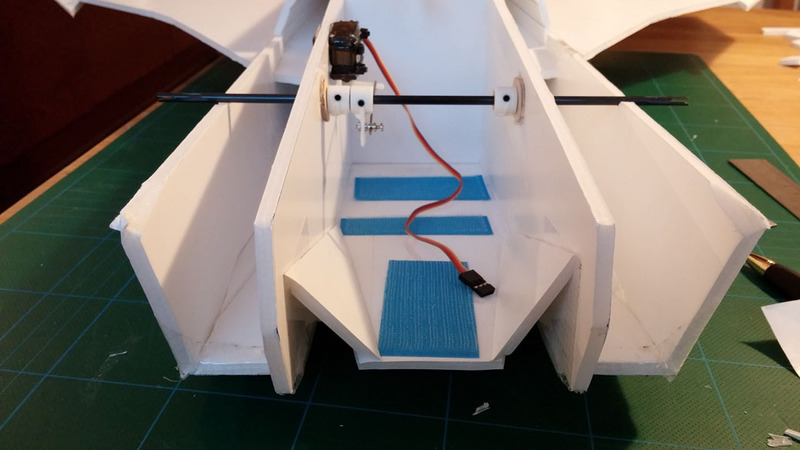 The ESC will be in the power pod, for both weight distribution and placement reasons, and the three motor leads will be snaked under one of the wing root covers. Since I had to wait a long time for my electronics to arrive, I had already built most of the plane before drawing the wires. That was a bit tricky, bit with a piece of string, some steel wire, BBQ skewers and pliers, I was able to pull the cables through and into the power pod. 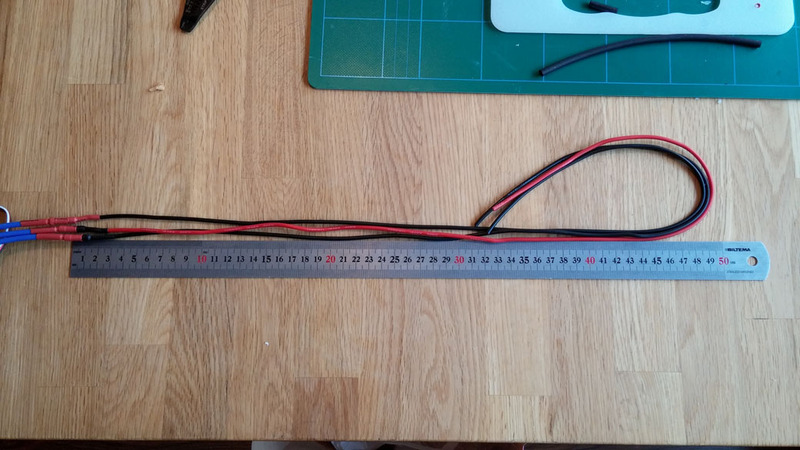 I twisted the wires to lessen any inductance problems from long leads. I'm still going to experience some efficiency losses, though. Wing root covers. 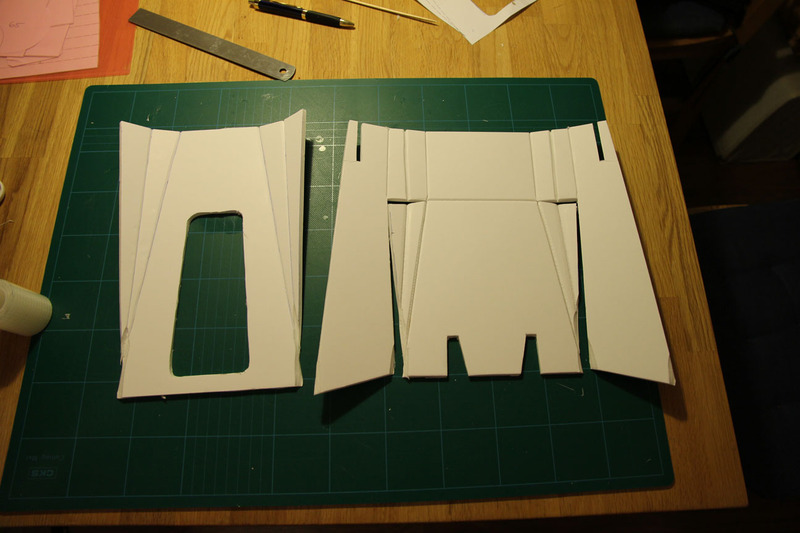 Those on top needs holes cut out for the servos. 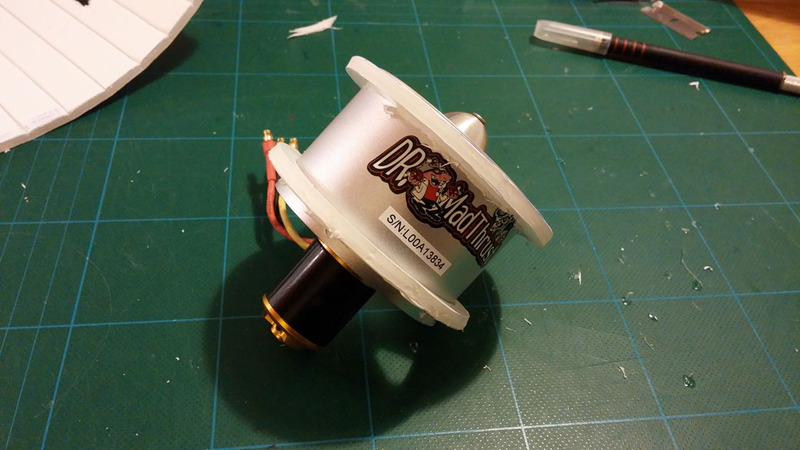 They are not on the plans yet, since it might depend on where you put the servos, and how bit servos you use. Time to put the top cover on the front. This part was necessary to cut off to make it easier to assemble, but that was no big deal. One of the things that will be fixed in version 2. Locking mechanism for canopy. Work in progress, but sound theory. Detachable nose. This part was difficult to CAD correctly (due to limitations in the specific features I use to automate drawing creation), and might need a bit of manual fitting. 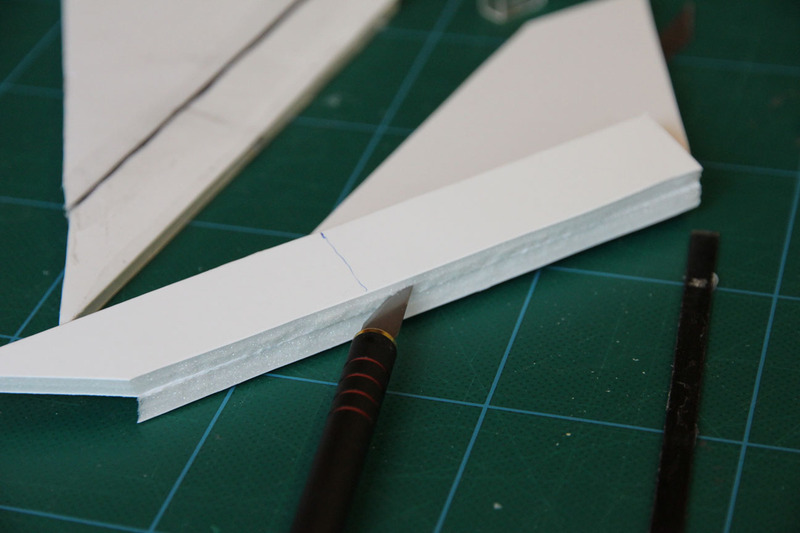 I'm reworking it to be more scale for version 2 - the real plane is not as oval, but has a more flat bottom which should actually be easier to make. 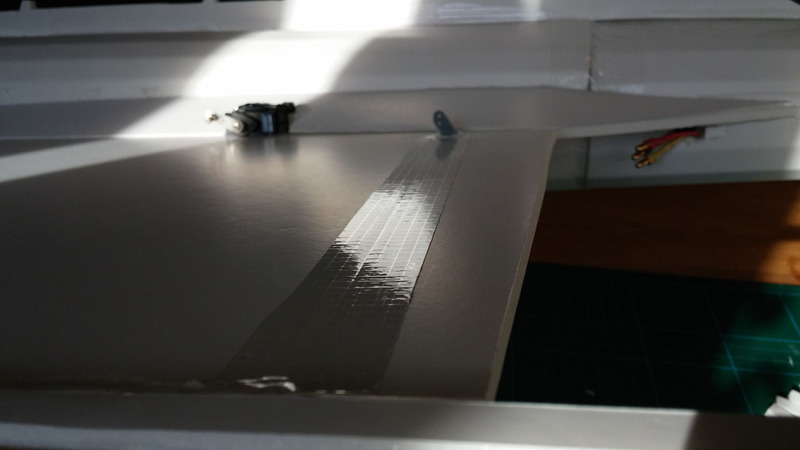 I attached it with a few drops of hot glue between the two joining plates, and tape on top and bottom. It snapped right off during a crash, and was easy to tape on in the field again. 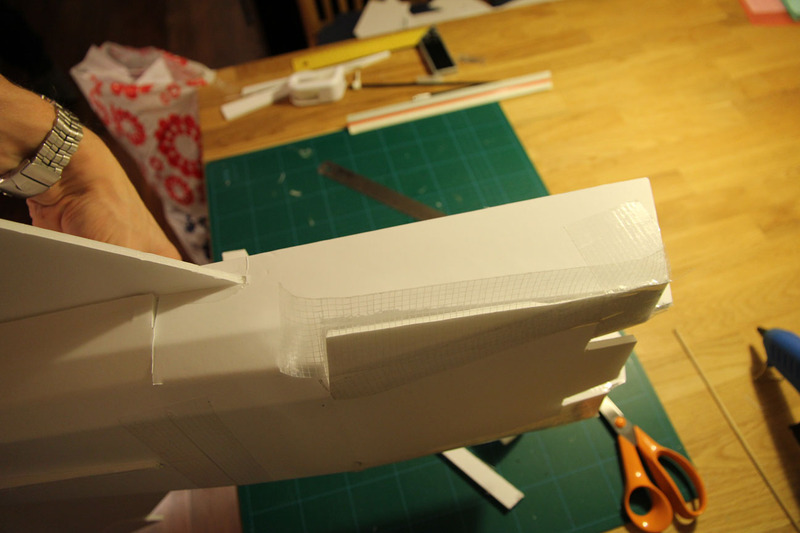 The canards were glued on last, since they are a bit fragile. 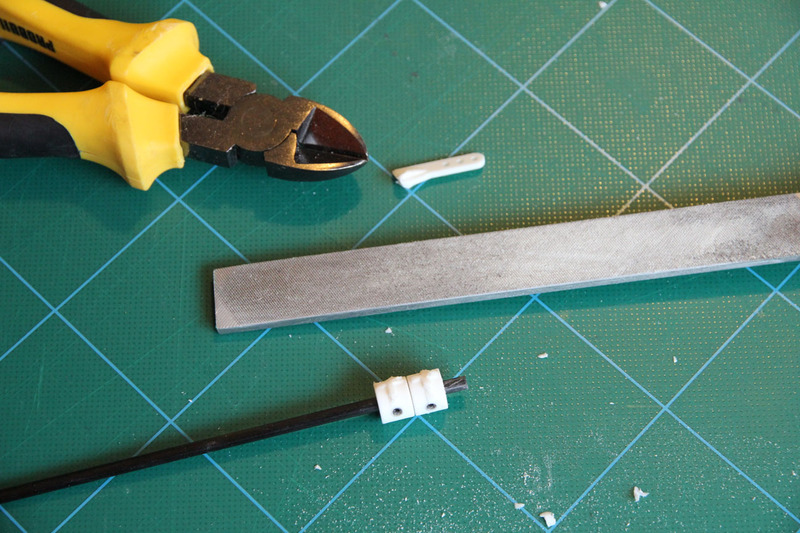 I used epoxy here, rather than got glue, to get as strong a bond as possible. Only time will tell how strong they are. Finished. Time to paint it! 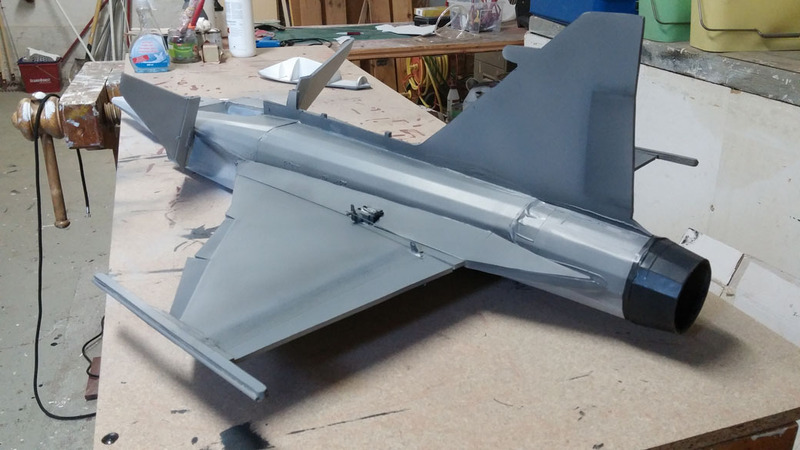 I settled on a common Gripen paint scheme, with a light nose and belly and a darker top. That both looks nice and provides a relatively good reference for what is up and down when flying (I hope). For being the first time ever holding an air brush, I'm pretty satisfied. I used the techniques described by Chad Kapper. 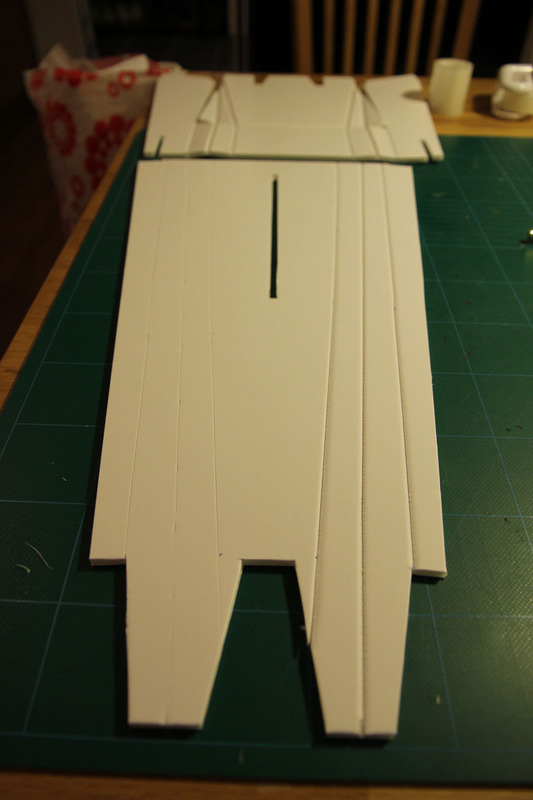 I used trial and error on scrap pieces of foam to find three shades I liked. Window cleaner really was a great way to dilute the acrylic color, too, since it dried so quickly. I will try to make some decals later, but for now, I just wanted to try the paint techniques out and water proof it somewhat. That was that. I'm afraid I don't have any super-details build log of version 1. There were a lot of things that I realized can be done better. 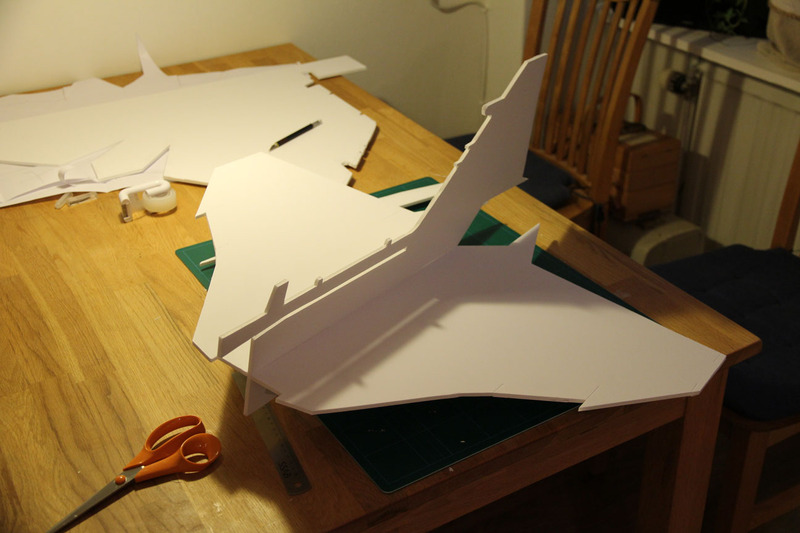 I do hope to make a version 2, once I've flown version 1 a bit. If there's a wish for it, I can see if I can make a proper build video for version 2. I'm sure I missed a lot of stuff here. If so, please forgive me. It's currently 1:41AM here in Sweden and I'm a bit tired. Just fire away with questions in the thread, and I'll try to answer them. After I've had some sleep. I saw your article from earlier and your design caught my eye straight away,thats one very nice looking build. Can I just say tho,don't be afraid of using bluecore foam,it can be used to great effect in models. 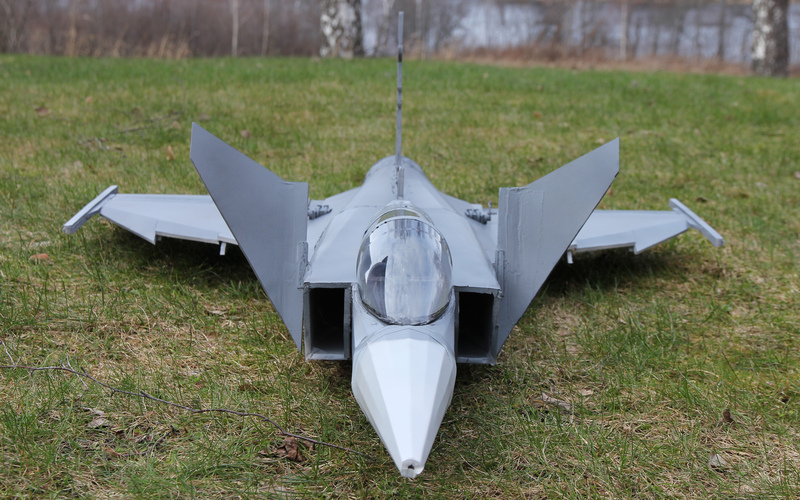 I love the Viggen, but this Gripen looks really cool! This bird looks great! Are the plans posted here any different from the ones you posted in the article? I will be getting them printed tomorrow so I can start the build. Could you post a link to the steering arms that you used? Thanks again for all the work you put into this project. Very cool! I'm going to give this a try when I finish my viggen! Yes, there's a few differences, mainly in the way the nose is built. Take a look at the first drawing and you'll see there's totally different parts. The main wing and other stuff is the same, though. I'd say that you can send either one for printing, though, because it's only the smaller stuff that's changed, and those are easy to print yourself using a regular printer. You'll need to combine 2 A4 pages in some cases, but most details fits on only 1. Regarding the nose: That is one thing I'm still thinking on how to build. I have one idea that works OK now, but it is not a perfect fit directly from the drawing - it needs some manual fitting with a razor-blade which opens up for user error. I really want the final design to be perfectly replicable by anyone. Great! I'll use the plans you posted here. Could you post a link to the steering arms that you used in your build? I did a little more flying today, in much nicer weather. Makes a striking silhouette, right? I had a couple of more or less successful flights, but it was very wobbly due to tail heaviness. 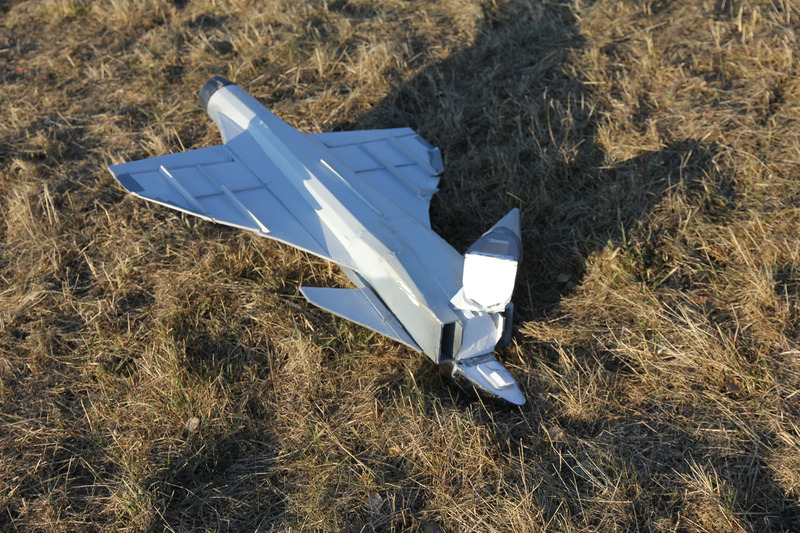 One hard landing broke the nose off, but it was quickly taped back on again. I then decided to put a Mobius on it. Just for you guys. The flight ended pretty rough when I lost orientation and came in way to fast towards the house, so I decided to put it down. Most of the damage was done to the nose, though. Now I have some repairs to do. 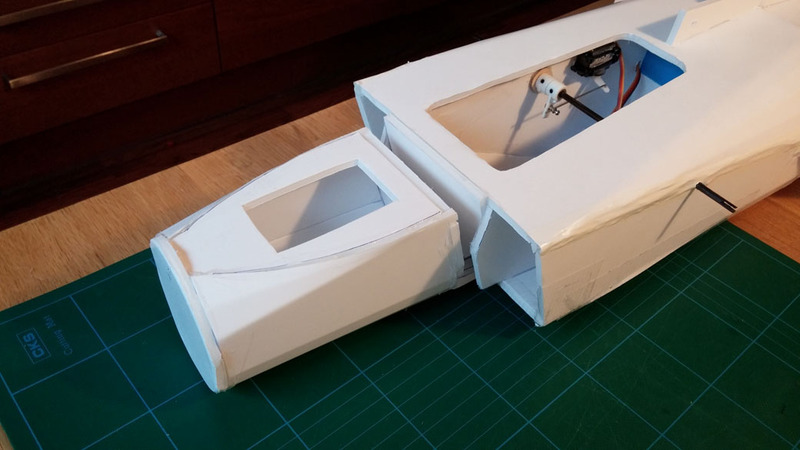 Hopefully I can repair the front part of the fuselage and just replace the nose, but if not, it's pretty easy to change the fore part. I am certain that I have to move the CG quite a bit forward, because the plane was incredibly pitch sensitive and liked to stall into a very high alpha at launch. 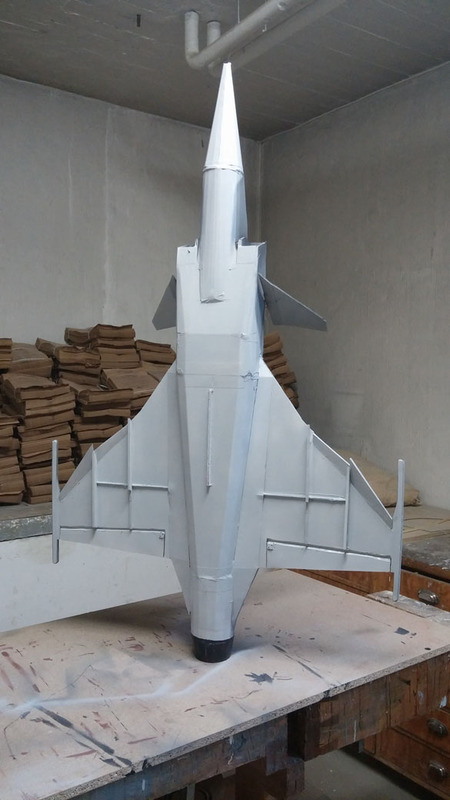 Currently the CG is about 20mm behind the large vertical fin/antenna behind the cockpit, but I guess it should be somewhere just behind the canards or so, if the FT Viggen is anything to go by. I wonder what your aim is with the CoG/CoL here, considering the profound differences between the Viggen and Gripen in this regard? On Viggen the CoG is forward of the CoL which I think is required for it to be stable. I guess the full scale Gripen does the opposite as long as the control system is having the canards generating lift. You are aiming to have stable Viggen aerodynamics with added canard control? I'm also very impressed you could hand launch such a heavy EDF with success! Thanks for the request! I will do that, once I've perfected version 2. At this point, there's too many things that will have to be tweaked and I want a clean article with clear instructions from start to finish. Thanks! My aim is to have a stable plane, like the Viggen. 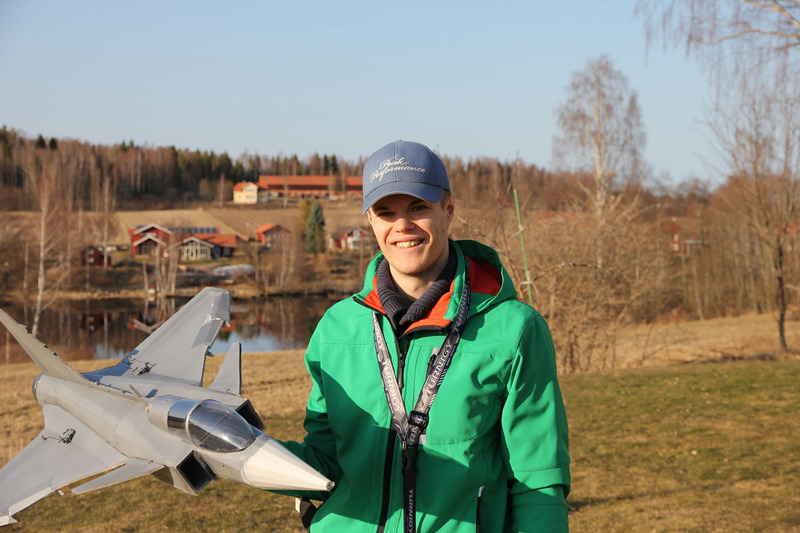 The real Gripen has relaxed stability where the canards are actually generating down force at certain points, but that requires fly-by-wire tech. I guess it might be possible to make in RC too - I have an Ardupilot Mega on order - but I still think that it would be counter productive. I want it to be easy to fly for everyone, but with the option of extreme control with the canards. I also think it will be possible to use canards and elevons together to achieve a flap-like effect, useful for slow start and landing, something that EDFs would benefit from. I had help hand launching it. Have you had any chance to fly this baby any more yet? I was thinking about the engine, you could cut a hole in the piece that makes up the wings and stuff the engine down there? Air intake is already slightly blocked by that piece, and I doubt that the blockage you'd get on the airflow out would kill the plane. Oh yeah, how did you make that canopy? Any news on this beauty? I have the plans and are waiting for my material from Svexo. Very nice model indeed, thank you for the contribution! Sorry about the silence on this project - I've had some personal matters that's taken up my time, and made me put building and flying on the shelf for a long time. 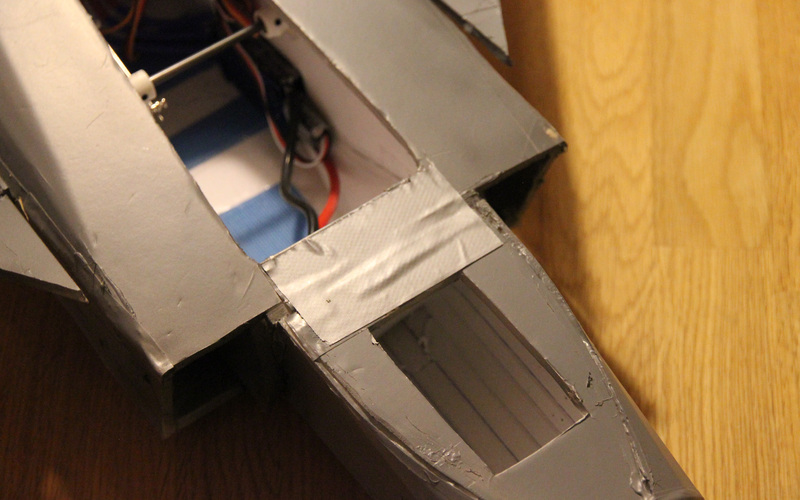 I hope to test fly it in the coming weeks, depending on weather conditions. the canopy is just a PET soda bottle cut in two pieces. No forming or anything needed, the shape of the top of the bottle works out nicely, but try to find a bottle that does not have that "bulb" at the part where the cone meets the cylinder. I hope that the 10% larger version 2 also can use a bottle without it being too small, but we'll see. 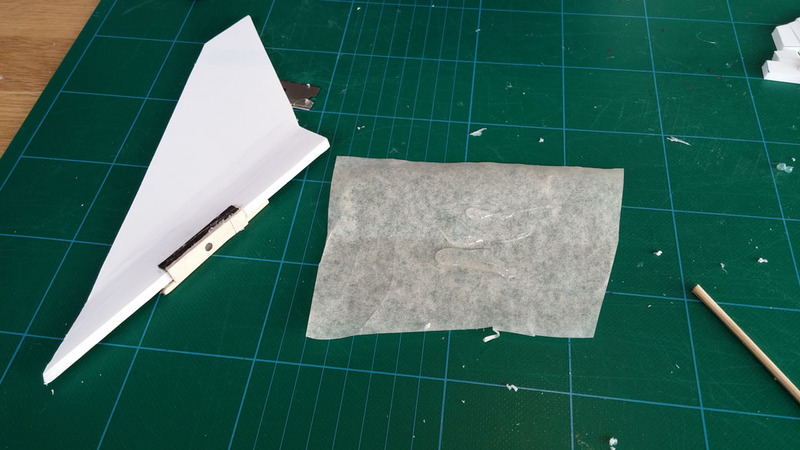 By the way, PET is a thermo plastic and can be shaped if you heat it above 70-80 degrees C or 158-176 F. But that would require a form to stretch it over, with the right shape and a very smooth surface to ensure a clear finish with no imprints. 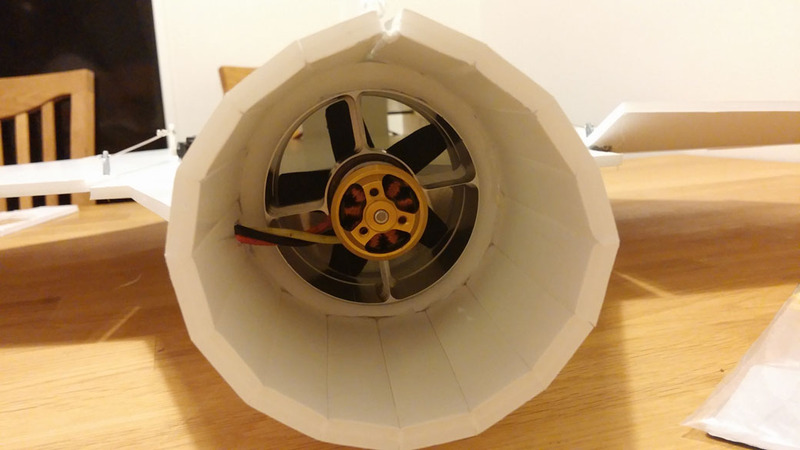 I found that to be a bit too much trouble, but for the FPV version I am thinking of doing that, but with PC (poly carbonate) which is clearer and sturdier than the PET you get in a soda bottle. Gotta get the best picture. 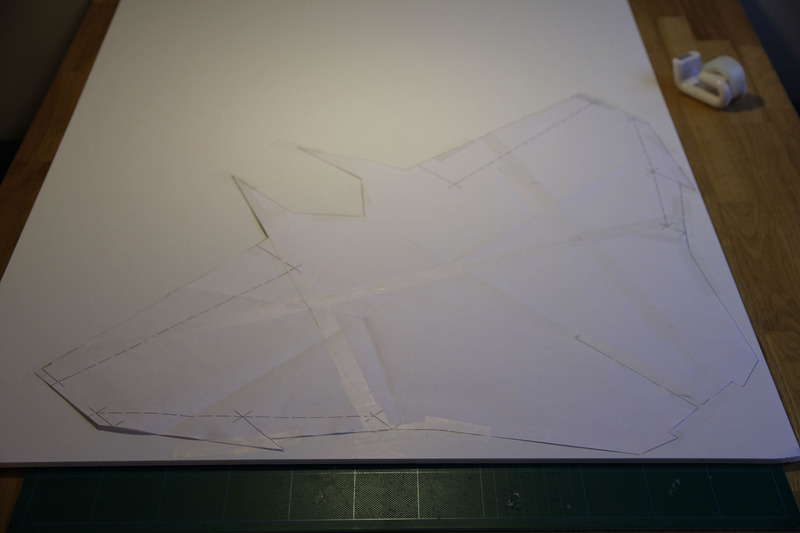 And just so you don't feel left out, here's the plans for the V2, even though it's not test flown yet. It should at least be better in theory than V1, so if you want to start building, do V2. You'll note that the very tip of the nose is missing, and that's because I've yet to find a good way of making it look nice with foamboard. I'll have a look at David's Viggen nose and see if I can get some ideas from that one. Otherwise the crafty builder can always make it from bluecore foam, like the bluecore Viggen, or just a cone of flexible EPP and some tape or something. Depends on the looks and durabilty you want. 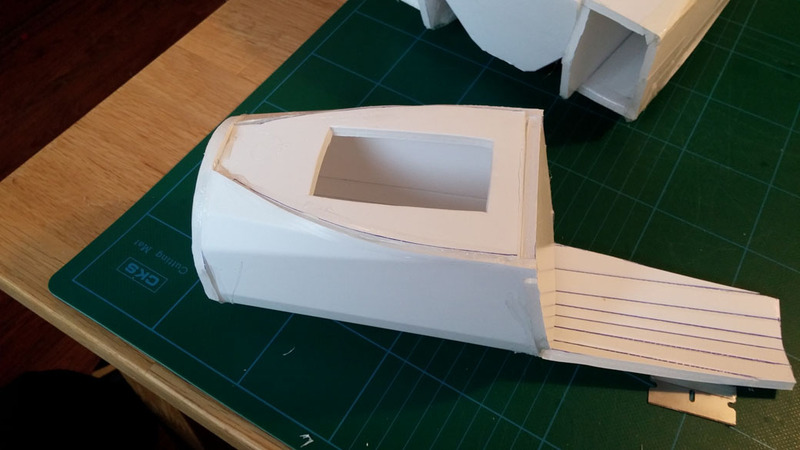 Please note, the plans are in scale 1:11, you need to print them at 110% scale to get 1:10.